Well, there’s been a lot of things going on lately. Andy Diggle was announced as the next Daredevil writer, and I gave the site a big make-over. While the former is undeniably much more newsworthy, I must say I’m feeling good about the new look, which took a few hours to put together. 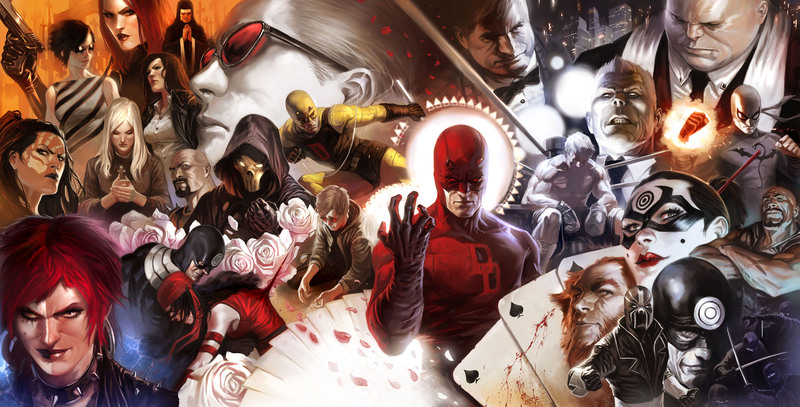 The new background, as you may have noticed, is taken from Djurdjevic’s Daredevil #500 cover. Alas, I thought we’d take a trip back in time again and continue our little exploration of Daredevil’s “uncanny” radar sense. We’ve now reached Frank Miller’s work on the title which means that there will be plenty to talk about. That’s why I’ve decided to divide this post into two parts. We won’t be looking at any panels this time, instead I will post what Frank Miller had to say about Daredevil’s radar and senses generally in an interview by Dwight Decker for issue #70 of The Comics Journal (January 1982). In my next radar post, we’ll look at how Franks intentions played out on the page. Below is a small excerpt from a much longer interview, but if the copyright holder (hi there!) feels this goes beyond fair use, let me know and I’ll take it down. TCJ:I’d like to discuss the extent of Daredevil’s powers. In one of the issues scripted by Roger McKenzie, Matt Murdock was shown hearing the Hulk’s heartbeat from four blocks away. MILLER: That’s pretty extreme. When I started writing the book, I sat down and defined for myself exactly the parameters of his powers. I think he has the potential of being very believable. The way to make him credible is to have his powers be extraordinary enough to be exciting, but not on par with Superman. One of the things I’ve done recently is revamp that radar sense of his to make the images he receives less distinct. I want it to resemble the “proximity” sense that some martial artists claim to have, where they can detect movement, form and location, but they don’t get pictures. I’m not fond of the radar sense in the first place. I haven’t given myself the opportunity to explore it very much. TCJ: Something that has bothered me in rereading back issues is how Daredevil explains to himself how he senses things – for the readers benefit, naturally, since he shouldn’t have to do that any more than you or I explain to ourselves how we see. Some of the explanations make him sound almost horrifyingly limited in his senses. In one issue, the Unholy Three are carrying him over a rope stretched between buildings, and Daredevil thinks to himself, “I smell hemp – we must be on a rope!” He should know where he is almost instinctively, but this sort of explanation makes him sound … well, blind. MILLER: Except that the appeal of the character in his earliest version was that we saw what was happening with our eyes, and he added dimension and depth to the panel by describing the sounds and smells. Also, because he’s blind, he’s just barely getting by. I find Superman to be a very boring character because I never believe he’s really in danger. Bullets bounce off of him. But somebody who could actually have trouble getting through rush-hour traffic interests me a great deal. TCJ: Yes, but for him to be a superhero? MILLER: Yeah! That makes him all the more heroic. Of course, the job is to make that believable. TCJ: He can read because his fingers are super-sensitive and he can feel the ink impressions on a page – although I could never understand how he could do that through his glove. MILLER: He doesn’t do it through his glove. Not when I do it. He takes his glove off now. TCJ: He has a sense of space, of course. You spoke of a proximity sense; he would be able to sense objects around him. MILLER: The way I see it, he’s aware of the general shape of things around him and how far away he is from other things. Particularly with people, he’s got a million ways of telling where they are: His hearing alone tells him not only where someone is, but how fast their heart is beating, how fast they’re breathing – which is a good indication of their emotional state. Very interesting. I was surprised that Miller, with whom I probably associate heightened radar sense more than any other writer, wasn’t a big fan of it. Regarding the Hulk’s heartbeat, it being the Hulk, I’d be willing to give Matt a by-ball on being able to hear it four blocks away. Like the green giant himself, it’s not unreasonable to assume it would stand out. Hey! Yeah, I know you’ve mentioned that before (about your impression of Miller and the radar). On the contrary, I find Miller to be one of the best writers at depicting Matt’s powers as fairly low-key and, as he says, “believable.” The only time I can remember thinking that he was way out of line was in the issue Devils, #169, when Matt hears a cough from blocks away (the Hulk’s heartbeat is more believable…), but that was a cool story so I won’t complain too much. We’ll see what we find when I post some panels. What Miller did do, that stood out to me, was use Matt’s sense of smell much more than had been done previously. I also thought he was quite good at making his sensory impressions feel real. In general, I agree with what Miller says here. The radar shouldn’t be too high-resolution. It shouldn’t be just like vision (sans the colors) because that’s a total cheat in my book. He also doesn’t need to be able to find something like a dropped needle on the floor in order to be an impressive fighter. Cats, for instance, are clearly powerful predators and they only have one tenth of the visual acuity of a human.